The Fasagh ironworks covered acres of ground on the south bank of the Fasagh Burn, near the shore of Loch Maree, there is evidence of sluice and dam at Loch Fada. The rough plan depicted shows the various parts. 'The work was evidently built on the "island" principle, and was surrounded by a water-course constructed of stones. On the island there was a roughly built house (A); two furnaces D and E with attached hearths B and G. The "island" most probably represented the forge where the manufacture of implements was carried on. A large furnace stood at I and had in front of it a bed of sand at J, to permit of castings being made. The whole site is surrounded by immense heaps of iron slag of the oldest black type. The only ore found in these works consisted of fragments of bog ore, which were obtained in the slags. Both hearths (B and G) have been made over the stumps of trees, which still remain. At hearth G, the roots of the tree have been surrounded by molten matter, which has cracked the wood and flowed into the cavities, filling them up. These ironworks seem to have been the last to use bog-iron, and to have been in use about the seventeenth century. 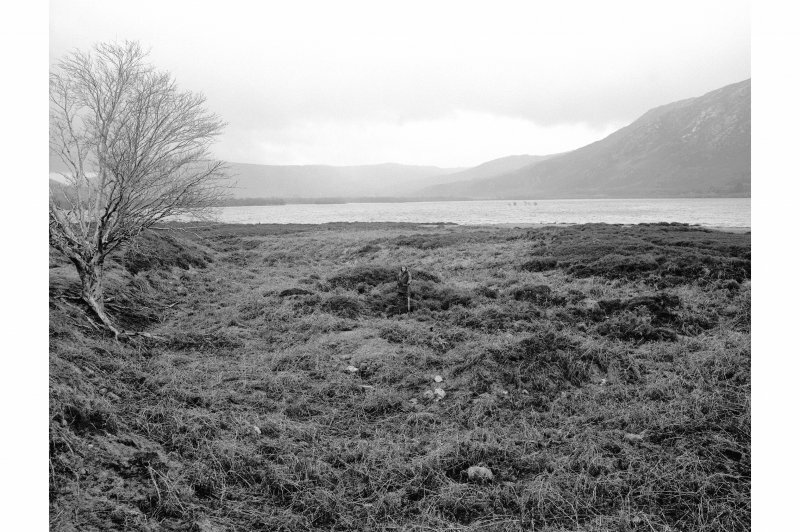 A lochan nearby (Lochan-Cul-na-Cathrach) is pointed out as being where the workers, reputedly English, deposited their tools when they left the district. NH 01056538 The remains of the ironworks, situated 150.0m E of the point where Abhainn an Fhasaigh meets Loch Maree are generally as described by MacAdam. Although there are now no remains of the actual works which are greatly mutilated and overgrown the respective positions of buildings A,B,D,E,G,I, and J can still be determined and the water course which surrounded the island, and is now dry, is still apparent. (Visible on air photographs RAF 541/A/541:3314-5) The island, which is triangular measures about 40.0 metres NW to SE, and tapers to a point at its SE end, by about 13.0 metres NE to SW across its base. The house, two furnaces and hearths are situated on the northern half of it. The approximate dimensions of the building are 7.0 metres x 4.0 metres while the hearths and furnaces are now so greatly mutilated that they are only apparent as 1.5 metre deep holes about 3.0 metres in diameter, apart from the hearth at G which is level and about 2.0 metres square. Within the hearth at 'B' can be seen the tree stump surrounded by molten matter mentioned by Authys 1 & 2. The large furnace at I is now evident as a small quarry about 10.0 metres in diameter with an earth and stone bank 2-5 metres high separating it from the sand pit at 'J'. Large heaps of iron slag are visible in the vicinity and the amorphous remains of a rectangular dry-stone building stand at NH 0109 6556 to the east of the site and are possibly associated with it. No trace of the sluice at Loch Fada remains. NH 011 654 Between August and November 1996 a programme of assessment, survey and excavation was undertaken around Loch Maree, Wester Ross, and specifically on the early 17th-century ironworks at Fasagh. The work focused on the assessment of previously identified ironworking sites, topographic survey, geophysical survey, excavations, and test-pits in support of the geophysics. In August 1996 an assessment of the Loch Maree area was undertaken as the initial step in the fieldwork programme. In the case of the previously identified bloomery sites no evidence of iron production was noted. The blast furnaces on the other hand remain as impressive monuments. No new bloomery localities were located on the burns traversed. Additional information was recovered for the sites of Fasagh, Letterewe and Red Smiddy, including at Letterewe the presence of haematite ore, and at Red Smiddy and Fasagh the location of settlement possibly related to them and also further structural components of these ironworks. NH 011 654 Excavation was concentrated in one main trench within the central working area within the elongated horseshoe that forms the centre of the site. The different construction details of both the anvil block casings, together with the existence of multiple floor layers, suggest a complicated history of construction. The site would appear to have had two phases of activity in the early 17th century, the first pre?1624 and the second post?1628. The spatial layout of structures, surrounding both anvil block machinery mountings and counter-balances, points to some regularity of building techniques. This evidence was further supported by the existence of parallel-walled structures within the trench which suggests separate wheel mountings to drive each hammer and, in consequence, separate channels to bring water down either side of the horseshoe. One string of these each was recovered to the NW of anvil block B. An interim report on this work will be lodged with the NMRS. Sponsors: Historic Scotland, Letterewe Estate.